This actually hurts my heart, but am excited for what is to come! 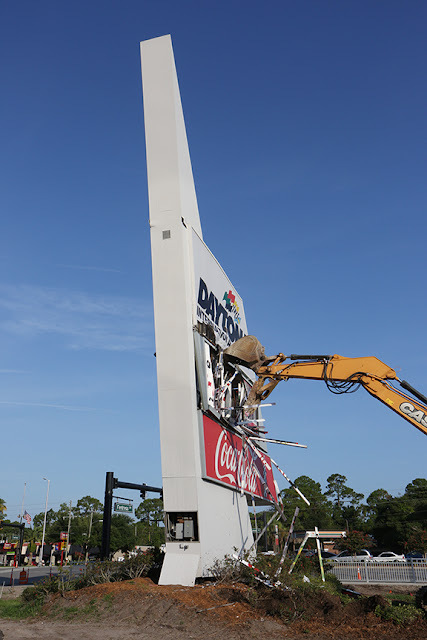 DAYTONA BEACH, Fla. – The Daytona International Speedway identification sign, which stands 57 feet tall and 48 feet wide along International Speedway Boulevard, was demolished on Thursday morning as part of the DAYTONA Rising project, the $400 million frontstretch redevelopment scheduled for completion in January 2016. The demolition process took only a few hours for the sign, which was originally unveiled in January 1994. 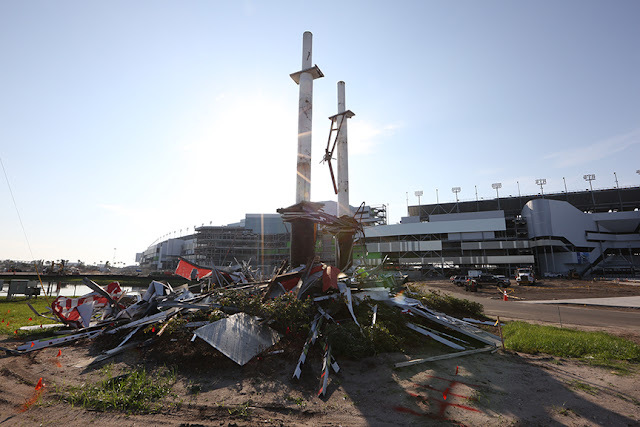 DAYTONA Rising is scheduled for completion in January 2016 in time for the 54th anniversary of the Rolex 24 At Daytona and the 58th annual DAYTONA 500. DAYTONA Rising is a $400 million reimagining of an American icon – Daytona International Speedway. Five expanded and redesigned entrances, or “injectors,” will lead fans to a series of escalators and elevators, transporting them to three different concourse levels. Each level features spacious social areas, or “neighborhoods,” along the nearly mile-long frontstretch. 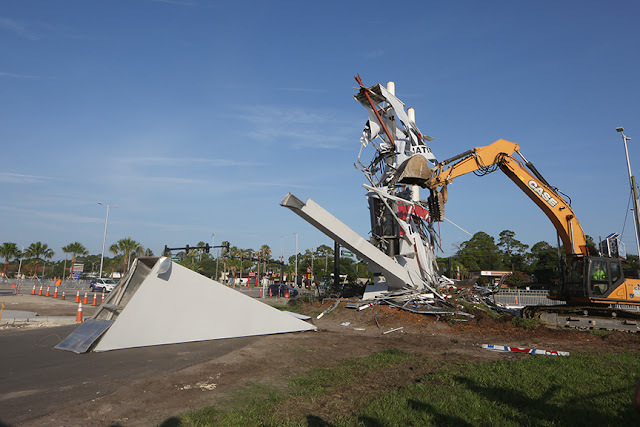 At the conclusion of the redevelopment, Daytona International Speedway will have approximately 101,500 permanent, wider and more comfortable seats, twice as many restrooms and three times as many concession stands. In addition, the Speedway will feature over 60 luxury suites with track side views and a completely revamped hospitality experience for corporate guests. 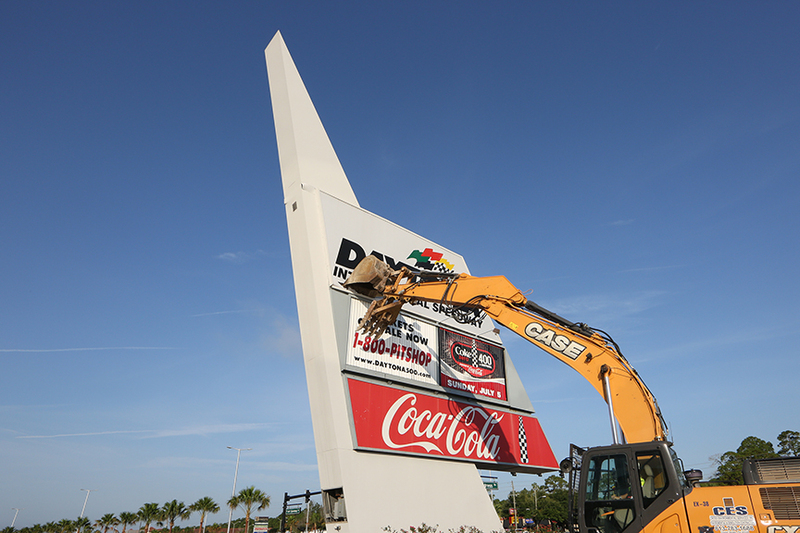 DAYTONA Rising: Reimagining an American Icon, expected to create 6,300 jobs, $300 million in labor income and over $80 million in tax revenue, will be completed in time for the 2016 Rolex 24 At Daytona and DAYTONA 500.